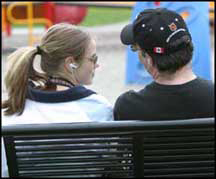 My daughter Jordan and I in a local park, sharing iPod earphones as we listen to our of our co-favourite songs: Bohemian Rhapsody by Queen. You haven't lived till you've seen Jo act out -- and sing along with -- all the operatic parts in the middle of the song. Especially when she's got BOTH earphones plugged in, and all we get is the frenetic actions and occasional piercing high notes as she bounces in and out of the room. My daughter ROCKS. I was having a conversation recently with Jo and her two cousins, who attend the same high school as Jo, and Jo accompanies them to their church's youth group every week. The three of them all say they want the same thing from their youth group: a more interactive approach to spiritual formation. Okay, they didn't use that phrase, but it's what they were describing. The three of them really enjoy getting into discussions about spiritual things, but they are adamant about being a part of the learning process, and for them, that means not simply being receptors. They were really intrigued when I shared with them how I have often approached interactivity in a youth group setting, ever since 1990. First of all, you don't prepare a long sermon, or a three-point alliterated teaching block. You spend the prep time brainstorming three or four kickin', open-ended, slightly ambiguous questions/statements that will be the framework of the meeting time. This is usually harder work! We listened to you, now you listen to others. One at a time, people, one at a time. As you go through each of the three or four vague-but-provocative questions/statements, the group has to decide which side they're on -- Agree or Disagree -- and physically move to that part of the room. Then, you let people debate and defend why they chose the side that they're on. If they change their minds half-way through, they are free to get up and move to the other side, but they must explain what changed their mind. My job is to be the faciliator, who keeps the dialogue going, ensures that both sides get equal time, and -- if they're getting too cozy -- throw in the occasional monkey wrench to make them think a little harder. Bonus points are given to those who can provide Bible verses to back up their ideas. Of course, if they take verses out of context, the other side is certainly free to point that out, and explain what they think those verses "really" mean. Respectfully, of course. Usually by the end, the teenagers have covered most of the ground that a leader would have liked to have taught on, and if there's anything that was missed, the leader (me) would be free to sum things up with an appropriate Bible passage. But the major difference is that the bulk of the meeting had been carried by the youth themselves, with leadership functioning as learning facilitators rather than content controllers. Sometimes you simply couldn't cover the entire topic as you'd originally hoped, because tangents sometimes are as good or better than the direction you were going, so you also need to be comfortable with a "teaching arc" taking several weeks to complete. The old "neat and tidy one week lesson" paradigm takes a serious beating in these settings, but the pay-off is seeing teenagers coming a week later, Bible in hand, to challenge each other (and me) with what they've been wrestling through during the week. Theres' an old saying about giving a man a fish versus teaching a man how to fish, which applies to youth ministry as well. We can give them the "right answers" and hope that they remember and internalize them, or we can equip them with the tools to learn for themselves, which will equip them far beyond the time that they are in our high school youth groups.